Out there its a killing time – animals feeding furiously in any break in the rain, an atmosphere of desperation as adults feed their young. Except for a small happy flock, dipping into their imported food, with soy-rich pellets. 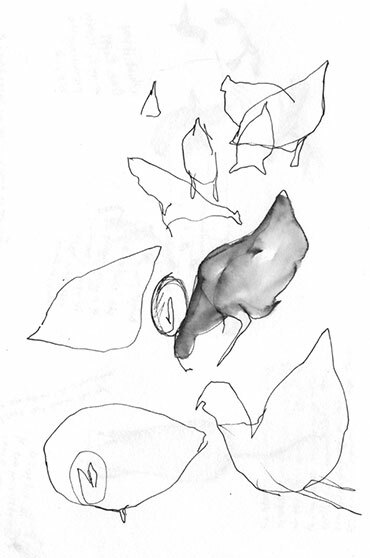 Six hens, laying an egg each day, scratching under trees in a garden at the foot of a lambing field. It is fenced in, to stop the hens scratching up new seedlings. Accidentally locked out of their coop yesterday – the crop of chickens’ eggs has disappeared. Who took them? Rat? I’m not good at observing rats. If I am close to one – captured in the ‘humane trap’ – I can’t look him in the eye. We are about to drown him. 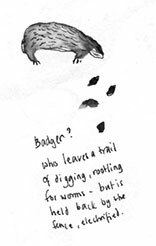 Badgers? who leave a trail of digging, rootling for worms – but they are held back the fence, electrified. Crows? 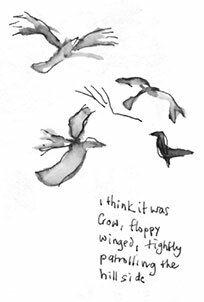 I begin to think it was crow, floppy winged, tightly patrolling the hill-side. 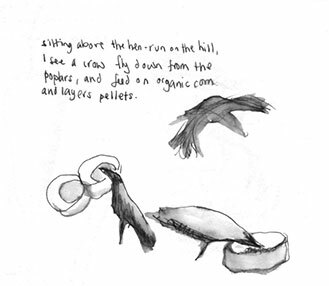 Later, sitting above the hen run on the hill, I see a crow fly down from the poplars, and feed on organic corn and layers pellets. Definitely most likely to be crows. Seen them swoop down and carry off even quite large eggs. Some hens run for cover, others run at the crow but he just laughs at them and makes off with the bootee.